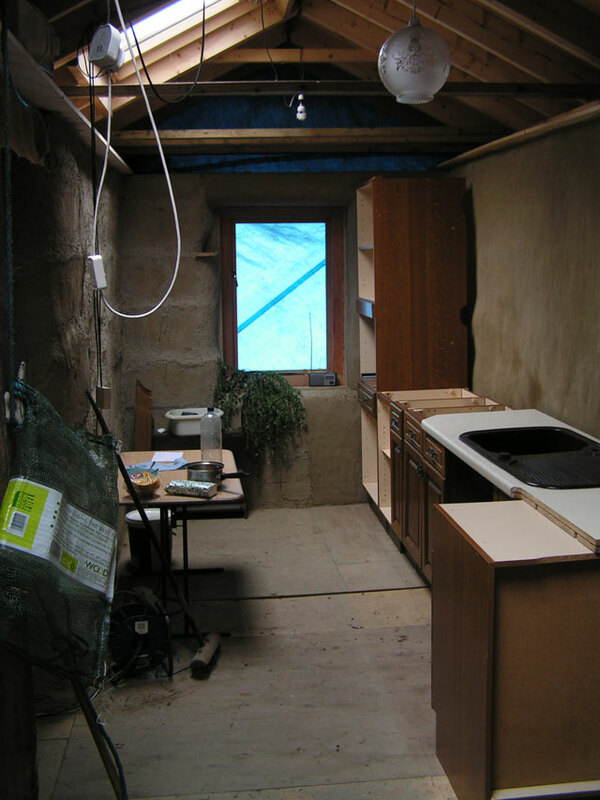 The cabin is a load-bearing straw bale building, 3m x 8m exterior, plus veranda, which we’ve built both to gain experience of building with straw and to live in while we build everything else. 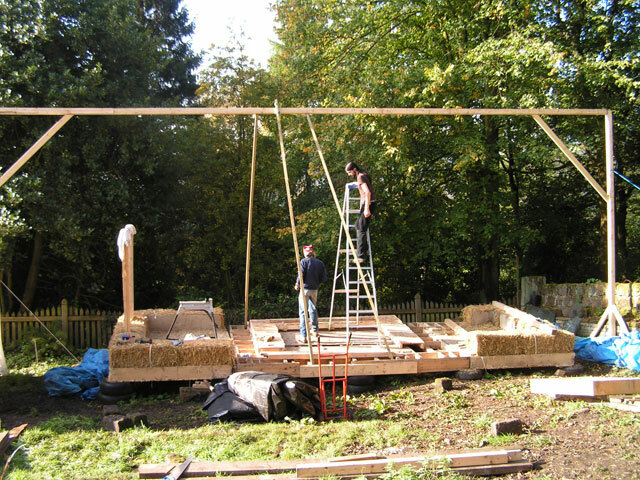 We built it from bits we were kindly offered at a good price by Barbara Jones of Straw Works. 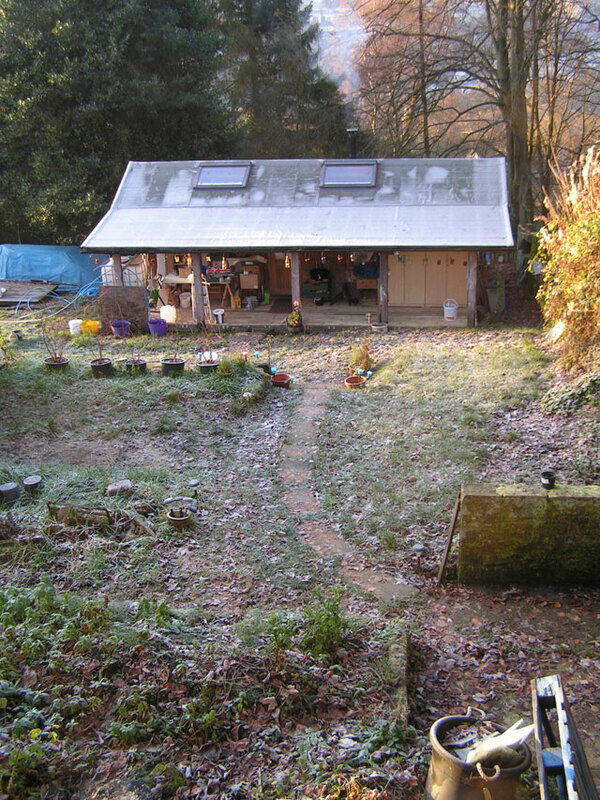 She had used them as training buildings while running straw bale building courses and needed rid of them in order to clear out a warehouse down in the town. 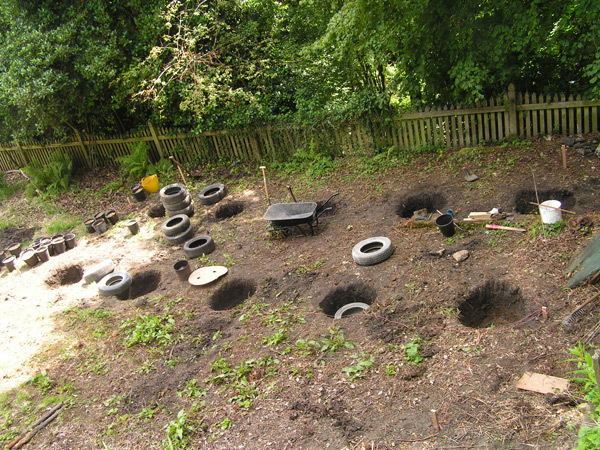 In preparation, we dug foundation holes down to the subsoil and filled them with stacks of tyres filled with packed pea gravel. As there was no vehicle access to the site, we constructed a system of rails over which we hoped to roll the already-constructed sections of building. 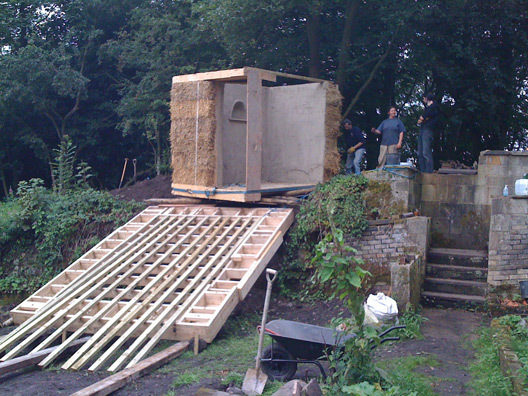 The building bits were delivered on a trailer attached to a tractor and fork-lifted into place at the top of the drive. Then we had to figure out how to get them down the 6 foot drop into the building plot! We used the central floor section as a ramp with the intention of rolling the two ends of the building down it (in a controlled way!) and thereafter onto the rail system, eventually to lower them onto the foundations. 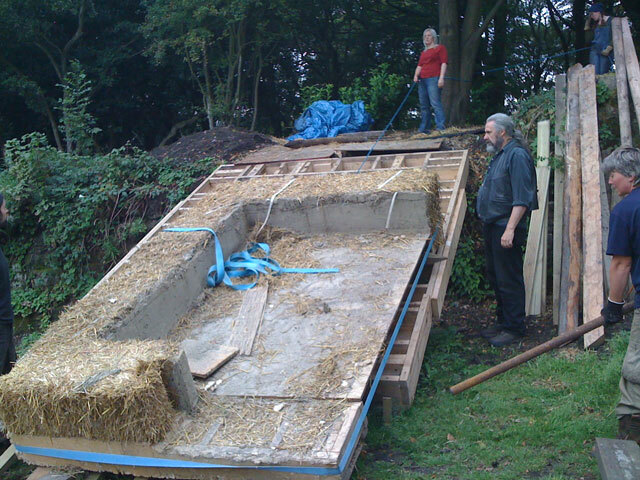 However, we soon realised that a “controlled” drop was possibly a bit optimistic with the resources we had, and rather than risk an uncontrolled drop, resulting in a heap of straw and clay, we covered the whole thing with a tarp and retired to think about our options. After much deliberation, we decided it would be best to cut the buildings apart into bales and bring them down by hand, leaving only one course on each floor section. 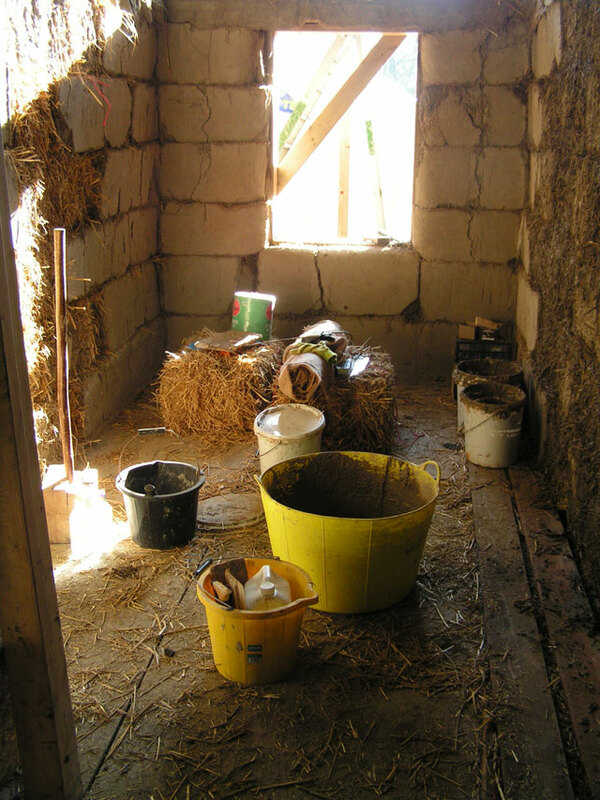 We used hand saws to carefully cut the clay interior wall between bales and deconstruct the building. The bales could then be brought down and stored in the marquee until the floor was in place. 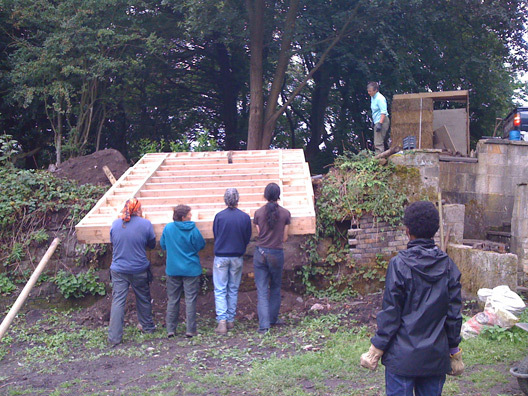 Having got the walls down to a single course, we could manage the aforementioned controlled drop. And thereafter things went surprisingly well. We used rollers (fence posts from the local agricultural merchant) and ropes, and a large team of volunteers, to slowly place each floor section on the foundations and then used bottle jacks to remove the rails and lower the floor onto the tyre stacks. 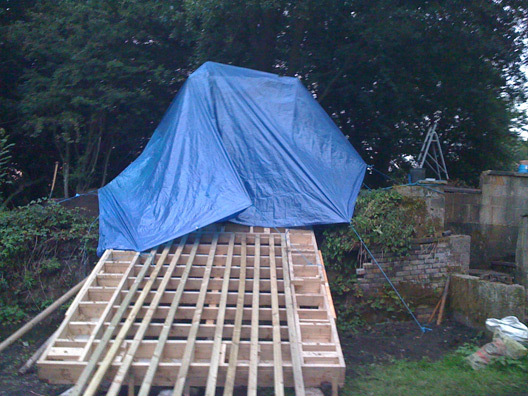 Conscious that the weather in Todmorden is usually wetter than not, we constructed a giant goal-post to hold up a tarp over the whole project. Thereafter we could re-assemble the bales at leisure. 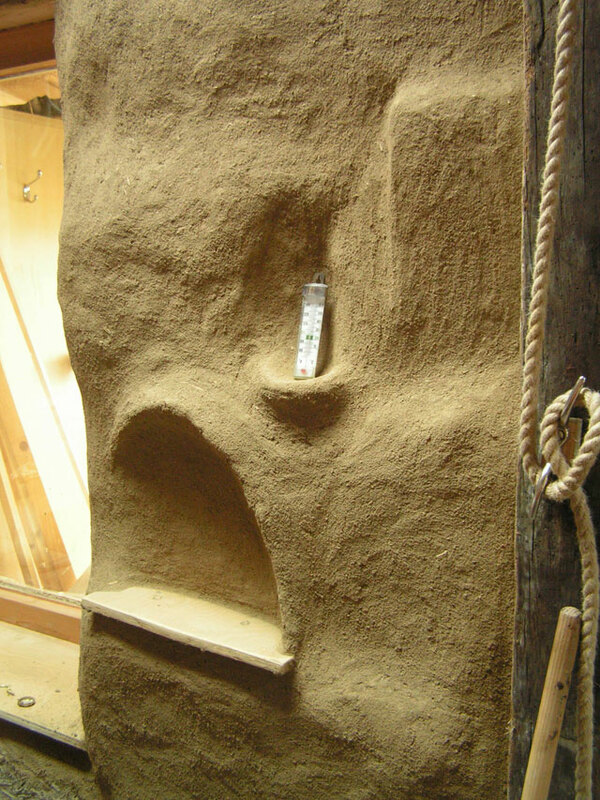 Much of the interior kept its clay covering and only needed to be patched, although large sections of the middle still needed to be clayed. 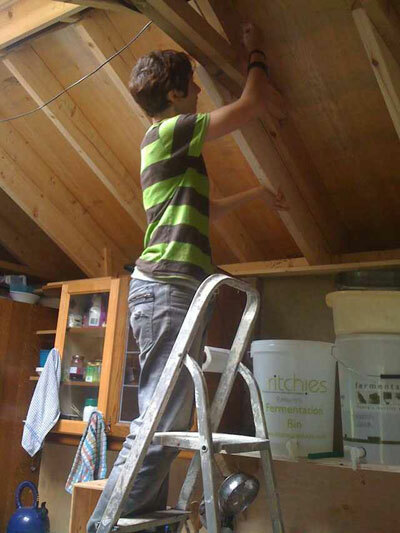 That job was great fun, basically involving throwing mud at the walls and squishing it around. 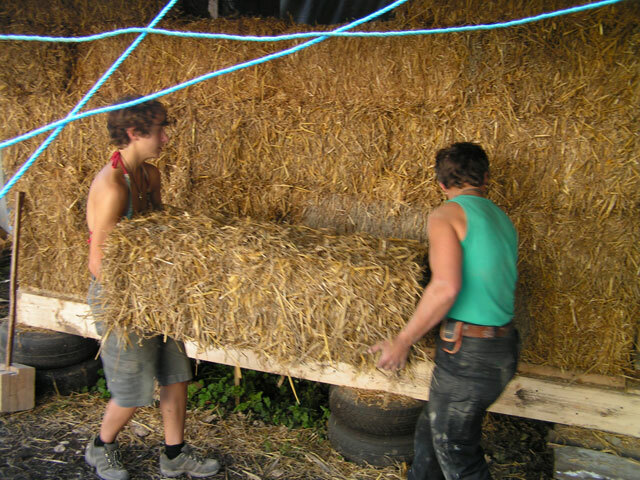 The roof is built directly onto the ring beam that tops the straw walls; there is no wood frame holding it up, only straw. 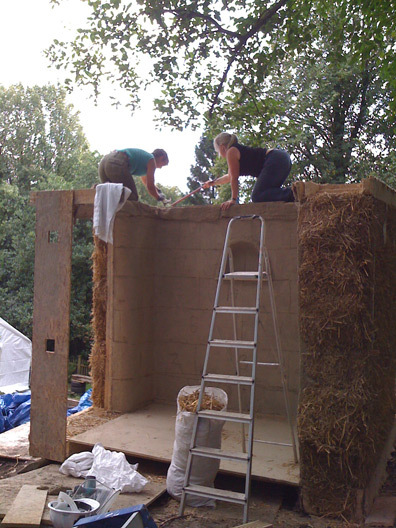 Roofing was completely new to us, so we had a lot of help from Straw Works on that bit. 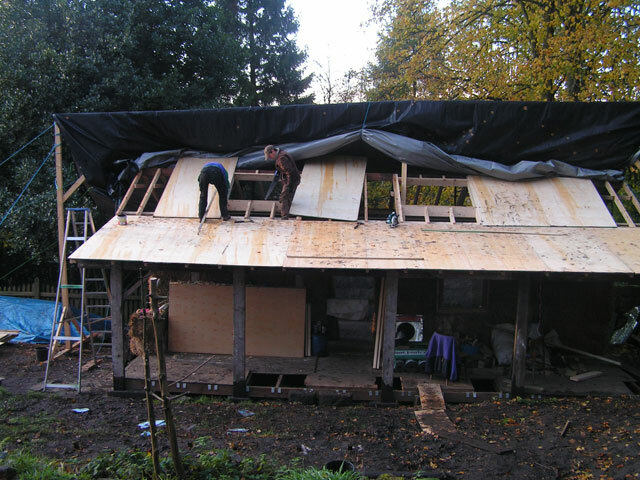 During spells of decent weather we could pull the tarp right back, which was handy for the roofing. 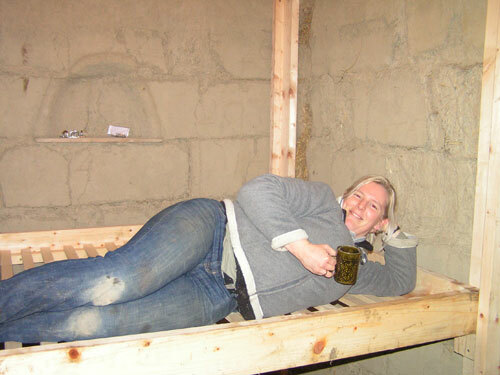 Meanwhile, inside the cabin, we built the crazy space-saving bed, which sits just above the dining area and can be raised by pulleys up to the ceiling during the day. 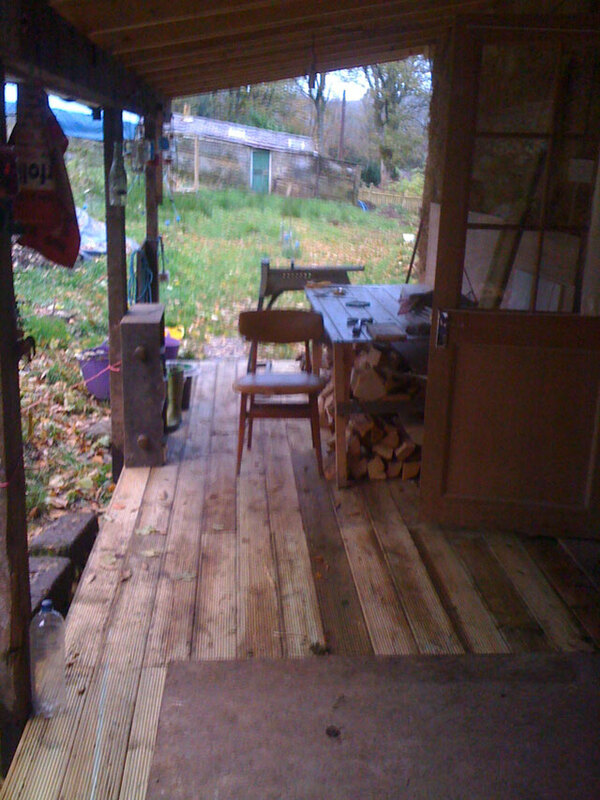 As you can see below, it allows the end of the building to be a practical and social space when the bed is pulled up. The claying of the interior went well, with some bits being smoother than others. It took me a while to figure out that a smoothing tool (made out of the cut-out side of a two-litre bottle) made a lot of difference to the final texture. Some bits ended up very flat and some bits ended up not at all flat, due to the haphazard placement of some of the pre-cut bales. But we made a feature out of most of the interesting wibbles in the finished wall. 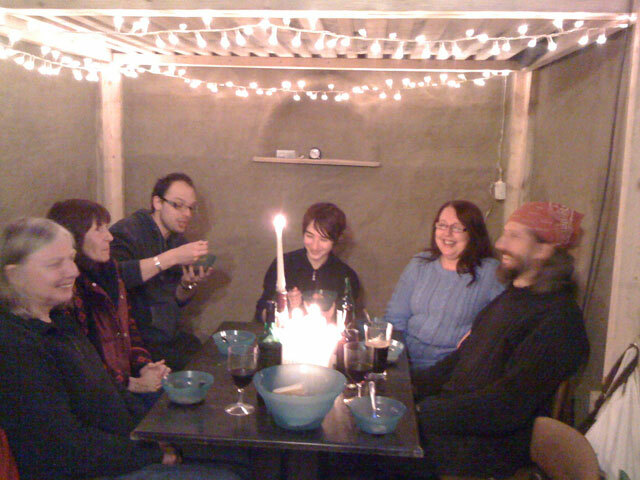 In about May 2012 we were able to have the first of many house warming parties in the cabin. 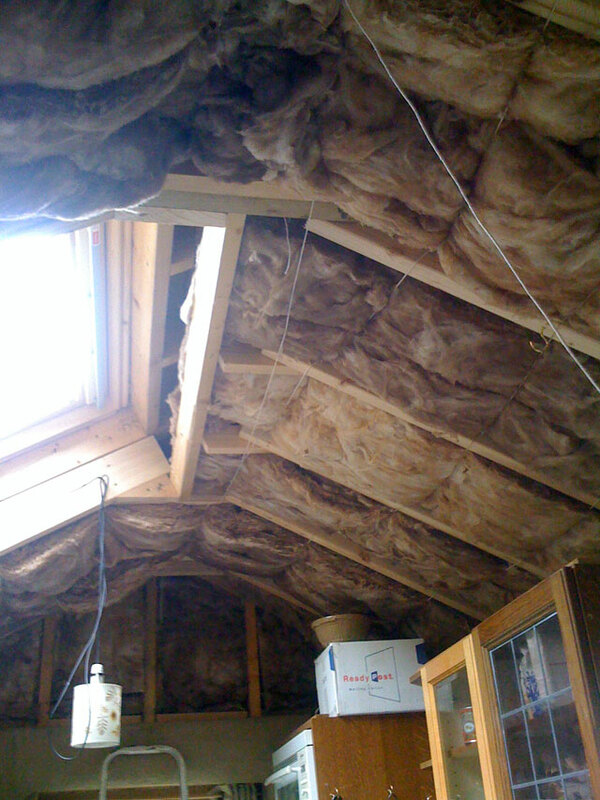 I’m afraid it was anything but warm in there, having no insulation in the roof yet, but we were certainly making progress. We had the good luck to find a perfectly functional kitchen with oak doors and several sections of work surface on the side of the road with a “free” sign on them. So into the trailer it went and we installed it as soon as the walls were clayed. 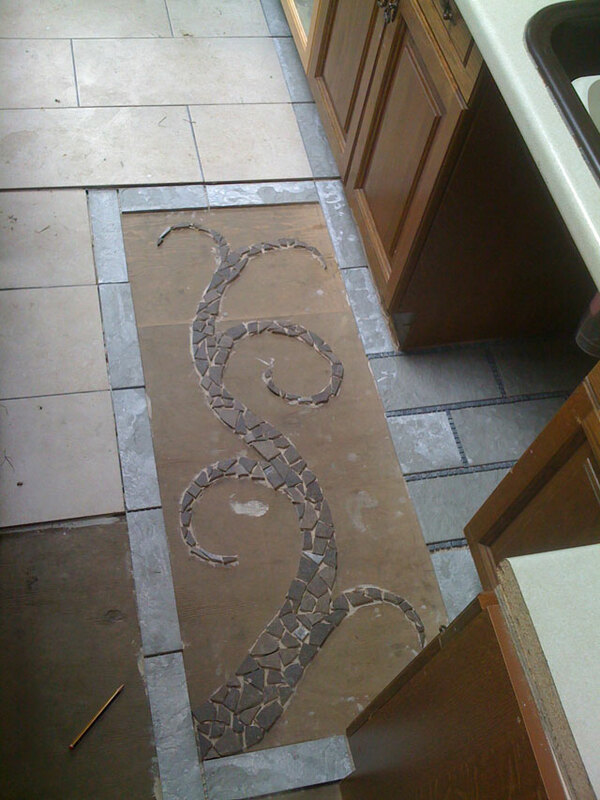 The floor was done with a combination of tiles from ebay and tiles from freegle (and bits and bobs I had lying around). 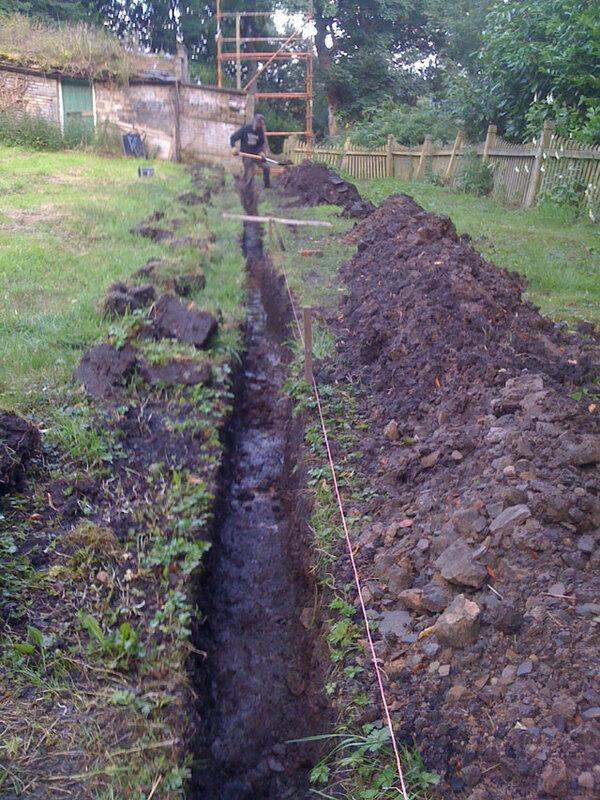 Elmo hand-dug a 50 metre trench from the bottom of the sheds adjacent to the plot, where we got electricity and water (eventually) onto the property. 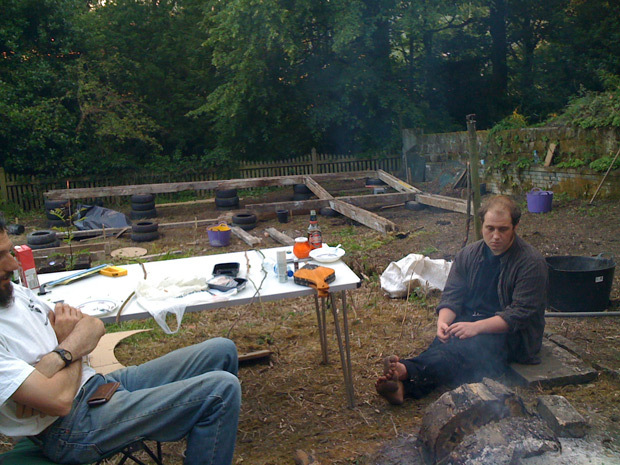 For ages while we sorted that stuff out we made do with water from the neighbour’s outdoor tap brought in in bottles in a wheelbarrow, and electricity that came via a reel of cable across the field. 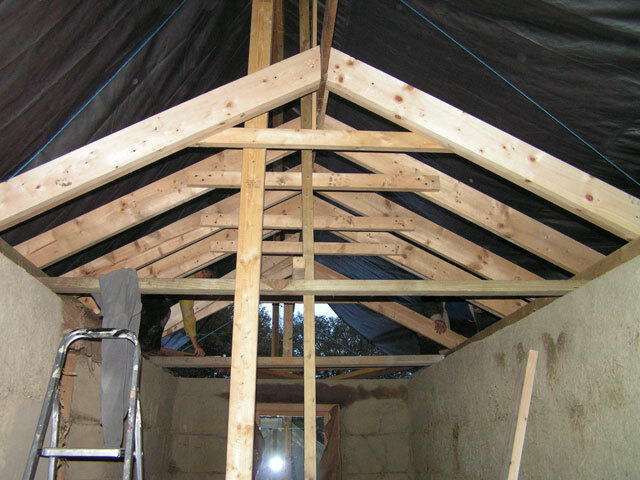 With much volunteer help we extended the rafters to take a foot of insulation. 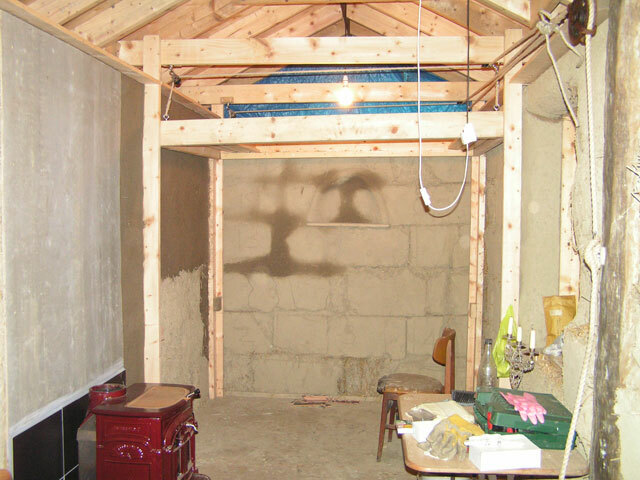 And once it was covered in plasterboard, the place was so cozy we found ourselves accidentally over-heating it several times. 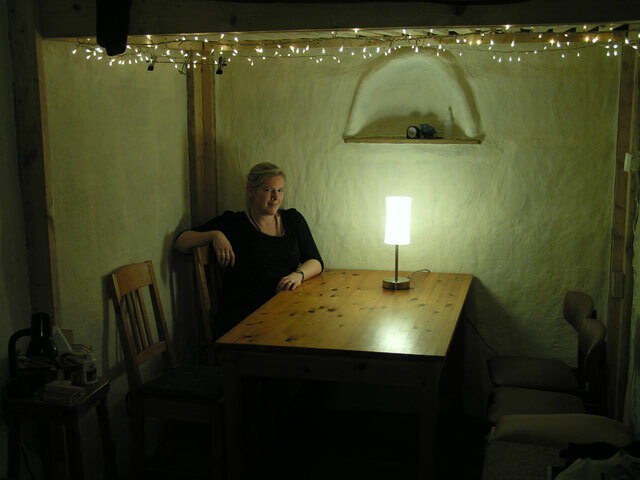 We’ve certainly got used to being very warm inside the cabin, even in the coldest of winter weather. The porch on the front of the building serves as additional living space in summer (and sometimes in winter) and also is a bit of a dumping ground for stuff we can’t otherwise find a place for. I do try to keep it tidy, but it’s a losing battle. 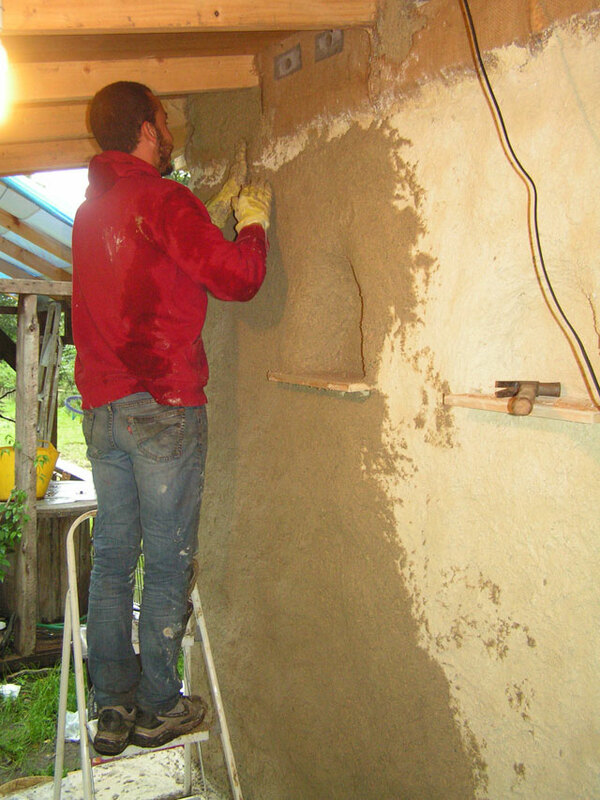 We’ve finally (nearly) finished rendering the outside of the building in lime render, again, with much volunteer help. It’s small (seven by two metres inside) and simple (still only have running water outside, and a bucket with a tap above the sink for convenince when washing up) but it’s home and a very comfortable one. We’re very happy with the idea of living in it for a few more years while we sort out the big build.